Ajay Tadepalli, MD is Assistant Professor in the Department of Hematology and Medical Oncology at Emory University School of Medicine. 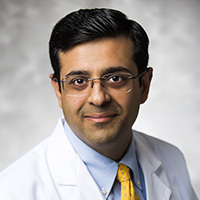 A board certified medical oncologist and hematologist, Dr. Tadepalli treats oncology patients at Emory Johns Creek Hospital and The Emory Clinic at Buford. Prior to joining Emory in 2017, he was part of the medical oncology team at Lewis and Faye Manderson Cancer Center in Tuscaloosa, Alabama where he was an MD Anderson certified physician during his tenure. Dr. Tadepalli is a member of American College of Physicians, American Society of Clinical Oncology and American Society of Hematology.